Visit Cozumel: Six Reasons to Pack Your Bags Now! 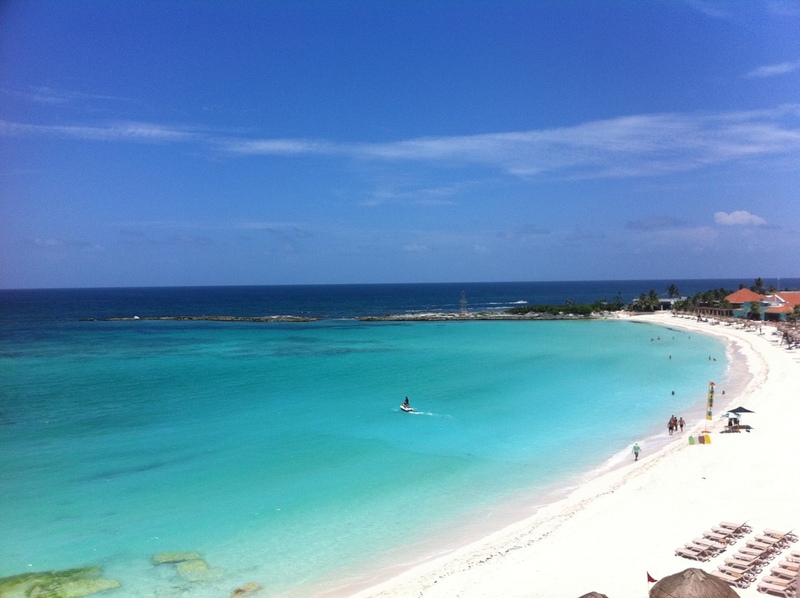 Visit Cozumel: Six Reasons to Pack Your Bags Now! In moody turquoise waters, off of the coast of Mexico, there lies a sleepy island sprinkled with fine white sand. Atop a labyrinth of coral reef and beneath the brazen sun, lies the tiny island of Cozumel. At first glance, non-pretentious, natural, somewhat secluded tranquility with plenty of local charm, Cozumel made me smile. At second glance, water undulating in the distance, dilapidated cobblestone streets, hammocks swaying over a jagged ivory coastline, motorbike rentals, the astringent odor of tequila, I knew I was in a place I could get lost in. Lost that is, in a time altering, eye opening, space shifting metaphysical sense. A mere 33 miles long from north to south, Cozumel's road is an exact loop around the island's periphery, making it pretty difficult to veer off course. That is of course unless you decide to trek inland without a guide, towards the surprisingly dense jungle and get abducted by a boa constrictor (the island has plenty after two snakes were brought to Cozumel for a movie shoot in the 70's and were set free to multiply). Non-endemic boa constrictors aside, Cozumel meets every expectation when it comes to a sleepy, serene, Caribbean island getaway. So without further ado, here's my list of reasons to visit the serene island of Cozumel. 6 Reasons to Visit the Island of Cozumel: 1) Cozumel has some of the best diving and snorkeling in the world! In fact, Jacques Cousteau put this island on the map in the touristy sense after exploring the reefs below. Cozumel's reef is second only to Australia's Great Barrier Reef. If snorkeling and diving don't appeal to you, you can always swim with whale sharks (don't worry, these gentle giants are neither whales or sharks, they're actually fish- ginormous docile fish) or dolphins. Whatever your pleasure, Cozumel is bursting with oceanic adventures. 2) Cozumel has a fascinating collection of ancient Mayan ruins! I'm a complete history nerd and I must say, the hours that I spent hiking through the mosquito infested tropical jungle to take in the ruins from the ancient Mayan civilization was my favorite memory from Cozumel. I loved learning about the shamans and musicians in particular whom played an integral role in shaping Mayan society. 3) Cozumel is a wonderful culinary destination! I love Mexican food, it's one of my favorite forms of comfort eating. The fresh ocean inspired Mexican food in Cozumel is some of the best food I've tasted in Mexico. Cozumel is so abundant with fresh fish and seafood, it's a pescetarian's dream! 4) Tequila! I mean, need I say more? I counted three fully operational tequila factories each with their own local spin and flavor. These factories are open for tours where sampling and tasting is encouraged. You can even schedule cooking classes to learn how the locals use tequila infusions to enhance the flavors of their cooking. 5) Cozumel is easy to navigate! As mentioned before the main road on the 33 mile long island is a loop. It is so easy to explore Cozumel on your own. The island is extremely safe and most locals are happy to chat- the majority of whom speak perfect English, if Spanish is not your forte. At the main port, where cruise ships come in, you'll find car and motorbike rentals. Traffic on the island is calm, I definitely suggest making your own adventure out of your trip. Taxis can get expensive, but a motorbike rental is only around thirty dollars a day. So there you have it. Cozumel, my friends is a gem. You can do as little or as much as you'd like. You can spend as little or as much as you like. You can stay on mainland Mexico and visit for a day or weekend, or you can fly directly in and spend the week in meditative relaxation. Whatever your pleasure, whatever your pace, Cozumel, is worth a visit. In the median of a highway I spotted her. Beneath the shade of the scarlet flamboyant tree, dressed in the colorful embroidered clothes of the Mayan, she sat smiling, a woven tan basket on her lap. Curiosity piqued, I crossed. “Hola.” I pointed towards the basket in her lap. She leaned the basket towards me revealing hundreds of tiny cloth dolls. Different shapes and colors, they were dressed in a fashion similar to hers. “Mayan sorrow dolls.” She said in English. I asked what a sorrow doll was, but her English could carry her no farther, and my Spanish had done for me all that it could. I purchased three, thanked her and was on my way. At the hotel, I shared my purchases with the woman behind the concierge desk. “Ah, very beautiful. Sorrow dolls.” Her smile held my answer. “What is a sorrow doll?” I was bursting with curiosity. “What is a sorrow doll? Ah, okay.” Leaning forward, bringing her elbows together, she rested her heart-shaped chin in the palm of her hands. The answer to my question came in the form of an inspiring story. I grinned. “Thank you for sharing that with me.” I placed my dolls back in their bag, glad that I had noticed the woman beneath the tree in the median of the highway. I walked away inspired by the story of the sorrow doll. The Mayans were true visionaries a world without sorrow, how about that? Out of the three sorrow dolls that I purchased, I’m going to try my luck with one. The other I’m going to save for Ohm. I’ll share the story of the sorrow doll with him when he is old enough to appreciate it. The final doll I would like to share with one of you. On August 25th, I will choose at random, an email address from my subscriber’s list, a simple thank you for reading and sharing my sojourns with me. If your name is chosen, you’ll receive an email from me letting you know that a sorrow doll is on its way. It will be your turn to share the story.